ILF (Inyurpolis Law Firm) is an independent Ukrainian law firm with a core focus on litigation and business support (business setup, transactional support, regular advisory support). The firm operates on the market for 23 years through its two offices located in major cities of Ukraine — Kyiv and Kharkiv. Among ILF’s strong points is the ability to follow up on court decisions and get tangible results. This is due to years of experience dealing with debt recovery for banks and insurance companies (USD 500 million recovered in 2007-2015) as well as deposit recovery from liquidated banks for companies and individuals. We carry out business support through our commercial, corporate, M&A, tax and other teams, that follow an industry-minded approach. The diverse expertise of the team ranges from business structuring and high-profile contracts to corporate acquisitions and asset deals. We’re known for our successful business structuring record in the IT sector, support of sophisticated technology contracts, and public private partnership (PPP) work in the field of healthcare and pharmacy. We help our foreign clients get clear understanding of Ukrainian business environment, based on our knowledge and experience in medicine and pharmacy, agribusiness and alternative energy, IT, banking and finance. Among our regular clients are Avon Products, Volvo, BASF Ukraine, Malteurop Group, Ecostar/DISH, SPS Commerce, EGGER and Amcor Tobacco Packaging. Our industry-oriented approach allows us to find legal solutions for business as well as manage projects dealing with institutional changes. In 2016 ILF lawyers working together with the expert team of the Ministry of Healthcare and backed by the World Bank and UNICEF designed legislation on primary healthcare reform. In addition, ILF is supervising a reform-pilot project in Kharkiv Region city of Chuguyev. The ILF team includes 50 highly qualified lawyers, attorneys, tax, investment and business consultants. 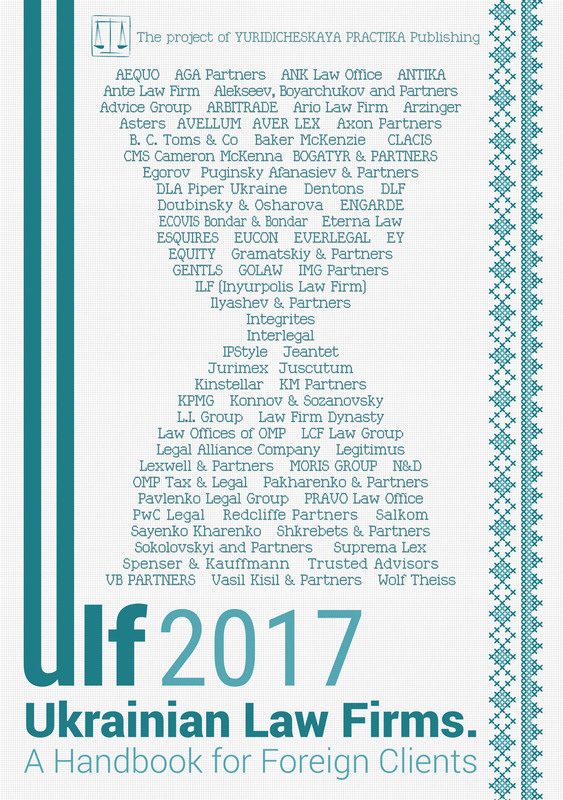 For six consecutive years ILF is in TOP-15 law firms in the national rating 50 Leading Law Firms of Ukraine in 2016 by Yuridicheskaya Practika Weekly. “Ukrainian Law Firms. A Handbook for Foreign Clients 2016” named ILF as one of the leaders of the Ukrainian legal market and places the firm’s partners among key experts in their respective fields of expertise: litigation, medicine and pharmacy, IT and labor law. In 2016 ILF was named number one in healthcare and pharmacy (Legal Awards 2016 by Yuridicheskaya Practika Publishing). Corporate law and M&A, land and real estate, public-private partnerships and privatization, labor & employment, intellectual property, tax law, criminal defense, debt recovery, bankruptcy, family disputes. When Can We Expect Functional Voluntary Health Insurance in Ukraine? For the past two years Ukrainian healthcare has been becoming increasingly attractive for investment thanks to healthcare reform. However, since the reform is yet legislatively unfulfilled, investors from Turkey, Israel, Georgia, United States and other countries are still sat on the fence, preferring to observe the market for the time being. In November 2016 the Government finally got to work, adopting the Concept of Healthcare Funding Reform. The Concept seeks to create a single buyer of medical services — the National Healthcare Service — with the principle in mind that reads “patients bring money”. Who will Pay for Medical Services? No matter where our patient goes, be it a public or private clinic, the treatment will be paid for by the state. Annual budget funding approaches USD 2.3 billion. These funds used to go to public and municipal hospital exclusively, but now private entities will also have the right to claim them. With payment dependent solely on the patient’s choices, the system will follow the principles of the Beveridge report already used in the UK, Italy, Spain and other countries. Ukraine’s budget, however, will not be able to satisfy all the needs of the population. According to the 2014 statistics report on healthcare, the budget covers 51.7% of expenses on medical services, a small part of which belongs to voluntary health insurance, and some 46% is paid for by patients themselves. The total market estimate is just shy of USD 4.5 billion. In the old system, over USD 2 billion from patients’ pockets ended up feeding the black market. The reason for this was uncertainty as to what kinds of services the state provides, and how much each one actually costs. Unable to tell which service had already been paid for, patients often had no other choice but to open their wallets. Under the new healthcare system, the government will set a list of budgeted medical services. Those not on the list will have to be acquired by patients themselves, but at clearly defined rates. In conjunction with new anti-corruption legislation, it should eliminate incentives for abuse in healthcare and pharmacy and discourage the black market. The system is due for launch in 2018 and should be fully operational by 2020. Implementation of the new funding mechanism and official payment (co-payment) for treatment by patients require legislative changes other than in the field of public procurement. There’s the pressing issue of amending Article 49 of the Constitution of Ukraine, which guarantees free medical treatment. According to the Constitutional Court, public and municipal medical institutions must provide treatment irrespective of its extent, without prior, concurrent or subsequent payment. The Constitutional Court also concluded that this does not rule out additional funding sources, such as sick funds and VHI. With current constitutional guarantees in place, public and municipal clinics cannot directly receive payment from patients, and until the Constitution is amended they will have to stick to VHI for additional funds. The new healthcare funding system adopted by the Cabinet of Ministers is not just beneficial to private clinics, but also to insurance companies that deal in VHI. Ukraine’s VHI market is currently in its infancy. Out of 323 insurance providers only about 45 offer this service, with the majority of sales divided among the leading 10 companies. According to the Ukrainian Legal and Economic Research Institute, over the course of 9 months in 2016 insurance companies sold USD 65 million worth of policies with a 52.86% premium. Next to the sums patients spend (over USD 2 billion, remember) the promise of the VHI market is evident, and there is a strong possibility that demand will increase in time. The fear of costly treatment in case of sickness and realization that free services are no longer a given could also affect the demand for VHI. Patients want assurances that they can count on their premiums when the need arises. Unfortunately, bankruptcy is not uncommon among Ukrainian insurance companies, as are cases when they refuse to pay up. As a consequence, lawsuits on premium collection are numerous. Evidence in cases like these is hard to come by and court hearings move at a snail’s pace: it takes roughly 2 years to conclude such a dispute. Moreover, carrying out the verdict and collecting the money also takes up to 6 months. Aware of the difficulties, people tend to avoid VHI altogether. Of course, patients can misbehave as well, such as by lying to their doctor about insured loss. It’s possible to anticipate this though in contracts with specific clinics of all forms of ownership (public, municipal or private). The insurance policy could contain a list of hospitals that should provide treatment. A contract between an insurance company and a clinic could oblige the latter to supply reliable information regarding the number of services provided and determine appropriate penalties. Furthermore, insurance companies can focus on selling VHI to employers. The Cornell University of New York showed that companies lose nearly three times more money when employees show up for work sick than when they stay at home. In light of this, businesses could certainly benefit from VHI. All the more so since current tax laws allow ascribing VHI expenses to total cost. In the old days they had to be covered by income. With no tax pressure and a number of lucrative offers from insurance companies, employers are further encouraged to acquire VHI policies for their employees. All in all, everything points to a rapid growth of the VHI market in the near future. The niche is open for insurance companies that manage to provide necessary guarantees and demonstrate the benefits to patients and employers. As for patients, made wiser by their brush with bankrupt insurance providers, they could turn to foreign players for reliable medical treatment.